Do you know how to cook or make boiled eggs? I bet your answer would be, "Yes, of course. What a silly question!" Today's topic is that of a simple boiled egg. Yet, there are many things that you may not know about boiled egg. As just about everyone knows, just boil the egg for 10 minutes and you're good to go. But once it comes to how you can peel the egg shell nicely and easily in seconds, then you'll be greeted with many different answers. Some people say that you should boil the egg with a little vinegar or salt added to the water to prevent the egg shell from sticking when peeling. 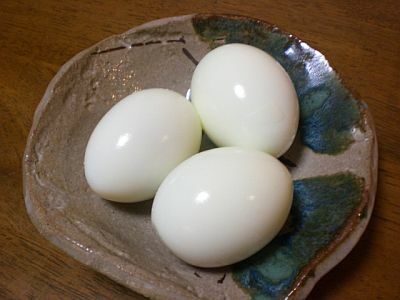 Some say that you should immerse the egg into cold water after boiling. But the real reason you soak it in cold water is to simply prevent it from overcooking. Others say that you simply need to wait for a few minutes after boiling. In other words, you just cannot find the right answer at all. Have you ever noticed that a nicely peeled boiled egg is tastier than an ugly-looking boiled egg, which is waterish and don't actually have a good taste. How could that happen? My friends went to buy fresh eggs and brought them home. They tried to make a nicely done boiled egg. Alas, they failed to create a deliciously-made boiled egg. We tried to research scientifically on how boiled eggs can be nicely and easily peeled, while at the same time achieving a tasty form. Once you know the reason, you won't make any mistake making boiled eggs the next time you make one and for the rest of your life. 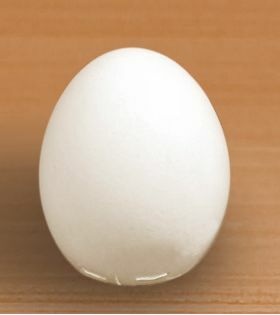 The larger end of an egg between the white and shell contains an empty space that grows larger as the egg ages. This empty space is called "air cell". We came to think of what it is and what it does when you boil the egg. On a fresh egg, the air cell is full of carbon dioxide (CO2). 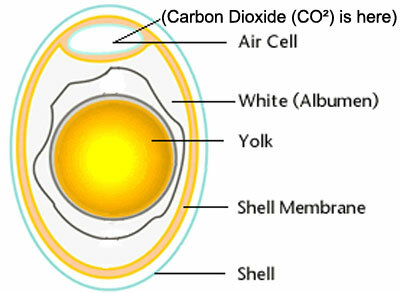 This CO2 is needed for a chick to develop or grow inside the shell of an egg. However, for boiled eggs, CO2 is an enemy. When fresh eggs are heated, the carbon dioxide expands and the egg white tends to adhere to the inner shell membrane more strongly, therefore making it difficult to peel. And worse yet, the remaining CO2 will escape through the tiny pores in the shell, and may lead to the egg white popping out from the shell itself. This will cause the egg white to be waterish and won't have a good taste—add to it the acidity of carbon dioxide. Just keep the egg for 10 to 15 days in your refrigerator. Yes, an old egg is a good candidate for making boiled egg. Old egg contains less carbon dioxide in the air cell since most of it escapes from the shell's tiny holes as the egg ages. 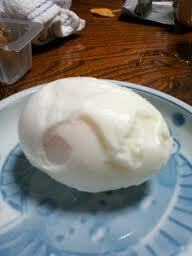 When old egg is boiled, it becomes easier to peel off the egg shell. 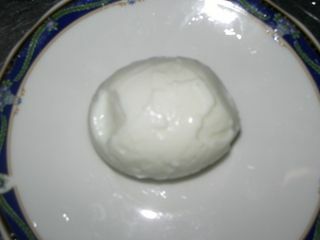 You will see a nicely done boiled egg with good shape and texture that is much more delicious than a boiled fresh egg. Therefore, the best guarantee of making nicely-done boiled eggs that are easier to peel is to use old eggs! It is as simple as that, but many of us did not know it. But what if I cannot wait for two weeks to make a boiled egg with my fresh egg? Is there any idea to make the freshness of the egg as if it is two weeks old? Yes, there is one good idea. Remember the "Egg of Columbus"? The expression "egg of Columbus" refers to a popular story of how Christopher Columbus made an egg stand on its tip by simply tapping the egg on the table, creating a crack so as to flatten its tip. You will do the same thing. Or, you can just make a pinhole at the larger end of the egg. This will make the carbon dioxide escape during boiling. In this way, boiling an egg using fresh egg can be 100% perfect. Even fresh yolk may give you a better taste. Is it not easy when you know it? Make a crack or pinhole at the larger end of the egg before boiling. Why a Greenish Ring Appears Around the Yolk of Boiled Egg? This happens sometimes due to manifestation of sulfur and iron in the egg, which forms when eggs are overcooked. A reasonable way to prevent this would be to avoid heating it for more than 10 minutes, which is good enough for home cooking. There are more technical methods or tricks to avoid such, but it may cost more than the boiled egg itself. Is Cholesterol in Eggs Bad For You? Some people say that cholesterol in eggs isn't much of a problem. Some say that it is bad especially for high blood pressure patients. But can it really affect the cholesterol accumulation in your blood? It may be because your doctor said that too much egg is the cause of your cholesterol problems. That may be a silly answer. Your liver makes more cholesterol than what you get from foods you eat. If you are healthy, cholesterol production within your body will stop to adjust. That's what we believe. If you don't believe it, check your cholesterol contents after eating eggs.